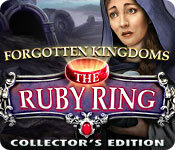 Forgotten Kingdoms: The Ruby Ring Collector's Edition is rated 3.5 out of 5 by 28. Rated 4 out of 5 by dancemom1 from Entertaining and a bit challenging... Hello friends. Well, another addition to the Forgotten Kingdoms series. There are a number of "Forgotten" games, but only one other in this series, which I did not purchase. In the beginning, the graphics seemed as though they were going to be somewhat cartoon-like, but after the opening scene, they were quite good. Colors are very clear, bright and true. Game play was very good, had no problems during the beta test or this demo. Voice overs are well done, age and character appropriate and don't sound like someone is just reading from a script. Music is rather soothing and changes tempo depending on what is happening at the time. There is not much in the way of animation, but this game seems to do fine without it. Sound FX are not many, but nicely done. HOPs are not many either, so far, but are clean and clear and items are not difficult to find. They are pretty straight forward and I did not see anything new or different. Puzzles were very well done and not as easy as you may think. They do take time and thought to complete. I had one that had me quite frustrated after a while, but I kept at it anyway. Jump map is very helpful and clearly shows where objectives are and where collectibles have been missed. SG is the usual. Hint system is very helpful but did not see that it transported you to other locations, since I used the jump map to see where I needed to go next. The only collectibles I found are 60 crowns. These are very well done, not all that easy to see, and well hidden in some locations. They are different shapes, sizes, colors and some silhouettes, but can be seen if you really look for them. The trick is to remember to look. Just remember, they can be anywhere. Really liked this challenge, and I think this is what made this one CE worthy. I found this game to be entertaining and with enough challenge to make me want more when the demo ended. I was disappointed when it was over. I liked the story line, even though it was nothing new, but with a little twist. I think this game will appeal to all levels of players. Yes, I am going to get this game for my collection. As always, try it for yourself and see what you think. We all have different tastes in games and you may not care for this one at all. Thanks for the reviews. Rated 4 out of 5 by jlowery329 from Fun game with some challenge So many games lately have been too easy. The Ruby Ring has some challenging games and not too many HOS. Good storyline. Enjoyed the length of the game ... felt like it was worth the CE! Rated 4 out of 5 by bubblegumbandit from Short But Sweet Based on the trial. Again, this is one of those trials that allows 90 minutes of play where it is certainly not needed. The trial took me less than half that time. Great opening. The music is beautiful, as is the artwork, and I immediately felt drawn in and wanted to play the game. So props for a great start up. I loved the scenery throughout the trial though the animation is a bit clumsy, and the lips don't move when the characters talk, which is a pet peeve of mine. I only came across one list HOP., which was fine with me. Since I always get rid of the sparkles, a couple of times I stumbled across scenes that were actually puzzles. There are lots of them, but they are all fairly easy. I liked the music, though the whispering is a bit creepy and got on my nerves after a while. There are coins to collect at the beginning and you can use them to buy items from a strange character on a hillside. There are also crowns in every scene, so collect them too. The story is nothing new; royal person has to save the kingdom, blah blah blah, but overall I found the game entertaining and would have liked to play a little longer. I don't think this game should be a CE and as such, I won't be buying it. But I might spring for the SE when it comes out. As always, please play the trial yourself before deciding. We all like different aspects of these games. Rated 4 out of 5 by snapnhiss from A pleasant way to spend the day This game doesn't have anything new or exciting in it but it's pretty and well acted with a serviceable story and some fairly hard puzzles. I enjoyed finding the crowns, they were well disguised and everywhere, even in pop-up scenes. I would have liked a better sale price but I think it's still good value for the money. Rated 3 out of 5 by Mrs_Kim from Very easy game Before I played this game I thought this may be another game of saving kingdom from a villain, and yes, that is true. Not another kingdom and bad man again!! I love the nice graphics but this game is way too easy. Many of the puzzles have been seen before, and basically I dont use any SG to guide me through, every inventory item will be used immediately. I used hint and map just to show me where to go next. Funny thing that I enjoy more of finding the collectibles than finishing this game. I just spent 30 minutes on demo, and when I checked the guide, that's just chapter 1. This game might be pretty long but if you are an expert gamer you might finish this game in no time. 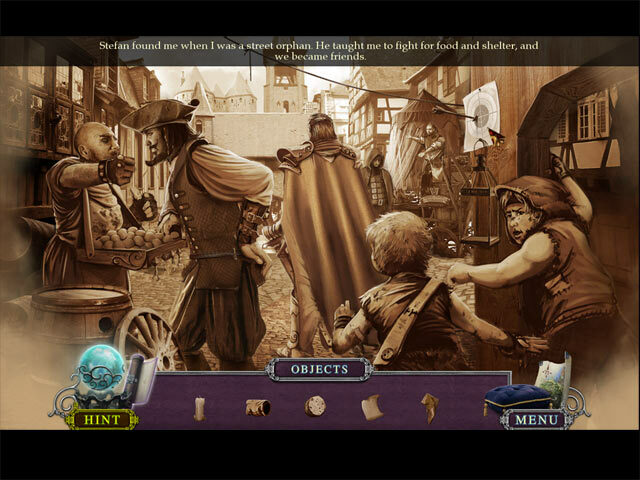 If you like kingdoms, bad guy and magic, this game might be for you. For me, I will pass. Rated 3 out of 5 by Granny_Gruff from No Enthusiasm for This One! Prince reaches his 18th birthday. The nurse, who spirited him away from the castle after a dark spirit attacked his parents when he was a baby, hands him a magic ruby ring and urges him to regain his rightful place. Admittedly she goes with him, but the way promises to be long and hard. He has only the ring to try to rid the kingdom of strange dark crystals that have popped up everywhere. Good Stuff: The interactive and very informative map; four levels of game-play, including a somewhat limited custom level; a couple of good mini-games among the ordinary; varied HOPs; 60 collectible crowns found in pretty much every scene and popup window. Bad Stuff: No character animation; no lip-sync and most of the VOs were lack luster; game-play is plodding; the artwork has that muddied unclear quality that makes you want to donate glasses to the artist. And once again, we save the kingdom, but at least we play as a hero this time. Please try the game for your self. You may find it just your cup of crystals. Rated 3 out of 5 by dlcoyte from Good graphics at very start that went right down hill after 5mins BORING... only fun was finding crowns... the outdoor spots were very hard on my eyes the graphics... not sharp at all... I used to buy EVERY CE out about a year ago... now Im lucky to find one lately.... whoever gave this 5 STARS must be in the stars... Bluck! my opinion... just didnt move me and found graphics poor... Had hopes but didnt last long... I tried though.. Rated 3 out of 5 by biscuitsmama from FORGOTTEN DESCRIBESTHE RUBY RING This is the second game in the Forgotten Kingdom series and The Ruby ring begins as the infant Prince Tristan (it looks like we play the game as the Prince) is being whisked away from the castle after his parents were taken by dark shadows. Naya, the young woman who saved you, has become your protector and raised you as her own. Now on your 18th birthday, you receive a ruby ring that belonged to your parents. As you open the box, it seems like the ring has some magical powers as it is floating and seems charged with energy. 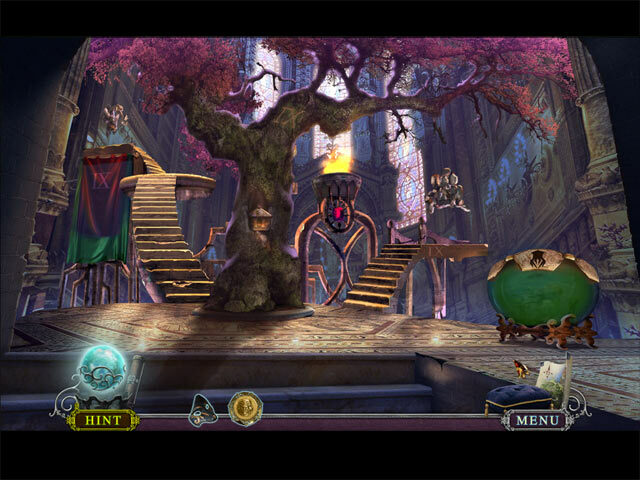 The Ruby Ring offers a choice between four modes of gameplay: Citizen, Royalty, Legend, and Custom. If you select the custom mode you have the option to set hints and puzzle skips in a range from 10 to 90 seconds. There is no option to turn off the tutorial until you enter the actual game. Although the graphics are crisp and clear they seem somehow flat and at times cartoonish. There are voiceovers but no attempt was made at lip-syncing. The voiceovers are okay but the dialog is rather hokey, and because the characters just stand there as someone reads the dialog they seem even more ridiculous. In games that are very well done, I sometimes don’t even notice that there is no lip-sync feature but in The Ruby Ring, the lack of lip-syncing stands out. Your tools include the ruby ring that will be used at times throughout the game. The first time it is used we have to complete a memory type matching game. Each time you need to use the ring there will be a different mini game to complete before the ring can be used to destroy the crystals that block your way. Along with the ring you have an interactive transporter type map that is present at the beginning of the game. The first HOP was a silhouette type with absolutely no interaction required to find objects. The problem is that some of the items are so tiny it is very hard to locate them. I ended up clicking all over the scene just so I could discover an item, and since I didn’t seem to have a penalty for excessive clicking, I am guessing that there isn’t one. The puzzles seem more difficult than they should be simply because of the lack of information on what to do. Aside from the mini-puzzles when charging the ring, I honestly couldn’t make it through the demo to discover what other puzzles exist in the game. Since most of the information is locked until we purchase the CE, I can only tell you that there are 60 crowns to be collected as we move through the game. Since it is very difficult to determine what CE content is in the game, I will not purchase it. IMHO, there is very little extra content aside from the SG and the bonus chapter, which isn’t enough to make me rush out and buy the game even with a sale. When BFG offers a two-for-one sale, this game would be a good option as a filler game. Although the game might be fun and many of you may really love it, the game just didn’t ring my bell. As a CE release, I expected a lot more and even with a sale the game is, IMHO, no better than many standard games on the market. Because the game is not terrible and might even be enjoyable in the end, I probably will use one of my many accumulated PCCs to get the game when the SE is released. In the end the game is not for me. As always, I recommend that you try the demo to see if this is a game you will enjoy. Rated 3 out of 5 by sunnyglow from IT IS "CRYSTAL" CLEAR THAT THIS GAME BELONGS TO THE KINGDOM OF FORGOTTEN GAMES FOUR CHAPTERS PLUS A BONUS CHAPTER - BASED ON A VERY SHORT DEMO Happy 18th Birthday Prince Tristan! With your parents kidnapped and missing, you must fight a usurper, Vincent to reclaim your throne - all with the help of a ruby ring. To me this game is not CE worthy. It has the appearance of an animated fairy tale book. The pace of the game is very slow. The graphics are cartoon-like. There are more puzzles than HOP scenes. The HOP scenes are varied including silhouettes, mini HOP scenes, lists and story book sentences with items to locate in bold. The puzzles are easy and include matching, variations of maze puzzles , Simon Says sequence puzzles, and a ring puzzle. There are no mouth movements for the characters. The collectibles are crowns which practically jump out at you. I felt this game lacked creativity and some of the extras and pizzazz we expect in CE games. This game is fairy tale book come to life. I feel this would be an excellent game for children. The game is very sweet with adorable animals including a jackalope! LOL This game may get better as it progresses. It is hard to rate a game after playing only one chapter. This game does not interest me and I will not purchase but perhaps you will enjoy it. Vincent reminded me of the character of Loki from the movie "Thor." LEVELS: Citizen, Royalty, Legend, Custom Hints 10 to 95 seconds Skips 10 to 95 seconds GRAPHICS : Cartoon-like with purples and pink hues. No mouth movements. I found the graphics at times a little blurry EXTRAS: Map is given to you at the start of the game 20 Achievements (It was difficult to tell) Ruby ring to absorb all dark energy Locate coins to purchase inventory items Collect 60 crowns Strategy guide Usual wallpaper, art, music, extra games HERE ARE THE DETAILS (SPOILERS) FOR THOSE WANT MORE INFO ON THE HOP SCENES AND PUZZLES HOP SCENES: They are varied but not many in the demo: A. Silhouette of a specific amount of an item B. Mini HOP scene to create an inventory item C. Item list with some interactivity D. Story - Sentences containing items listed in bold golden letters PUZZLES: They vary and are very easy A. Matching of two symbols B. Press symbols on a book to create a potion C. Variation of a maze puzzle using symbols to find a path D. Variation of Simon Says with musical notes playing a tune E. Variation of a ring puzzle connecting lines to four corners to energize a tree F. Type of maze in which you must fill in all the squares without retracing your steps G. Another type of maze using an arrow to strike out all lighted crystals H. Match flowers to etchings. Rated 2 out of 5 by kerith90angel from Based on the demo only I've been playing these games for years, and the kingdom games just aren't for me, this story has been done to death. There are some adorable animals in this game and I think it would appeal to the younger set. The bonus had a lot of concept art and only 4 wallpapers (in 4 sizes) Concept art, and music to save really aren't on my list of go out of my way to buy for a CE. Really wasn't a fan of the hand drawn- or hand painted aspect of this game either. I prefer more computerized graphics that are crisp and easy to see your way around a scene, especially if your hunting for hidden objects. Rated 2 out of 5 by Fuphyter from I REALLY HAVE TO START TRYING GAMES OUT I should have paid more attention to the reviews. I remember enjoying the other Forgotten Kingdoms so I bought it. BIG mistake. It is challenging so I rated that higher. There are a few things that annoyed me. One, is the pointer, it just points one way so trying to go back or to the left or right isn't easy. The story line is horrible..well, almost ridiculous. One character annoys the heck out of me. Basically this is the worst game I have played in ages and I play A LOT!! Spoiler below on the ridiculous statement. How does someone walk into a castle and steal something very, very important!! Plus, the thief is a kid...go figure. Rated 2 out of 5 by judeejuju from Boring! I played only 18 minutes of the demo then deleted it because I was bored. I found the game play very simplistic and the storyline unengaging. I usually love this genre of game but this just didn't do it for me..sorry. Rated 2 out of 5 by mrm2006 from A Nice Story but very boring game play. The Kingdom of Minah was attacked and the King and Queen ..... disappeared. But, Naya, a young girl herself, grabbed the baby, Prince Tristan, and ran to the forest to hide him. Its now his 18th birthday and time for Prince Tristan to make his rightful place in the Kingdom. Unfortunately, .... it doesn't come easily. Difficulties: Citizen, Royalty, Legend and Custom. Graphics: A little 'old school'. Music: So beautiful. I don't know how to best describe it. It elicited the feeling of "I want to continue", "It's time to move on". Voice Overs: Very disappointing as there was NO lip syncing. What?!?! With all the amazing things games can do these days, there is NO voice over?!?!?! During the game play you have a transportable map, a journal, a tutorial and the Ruby Ring (which causes the crystals all over the kingdom to disappear). Using the Ruby Ring is a mini game in and of itself. 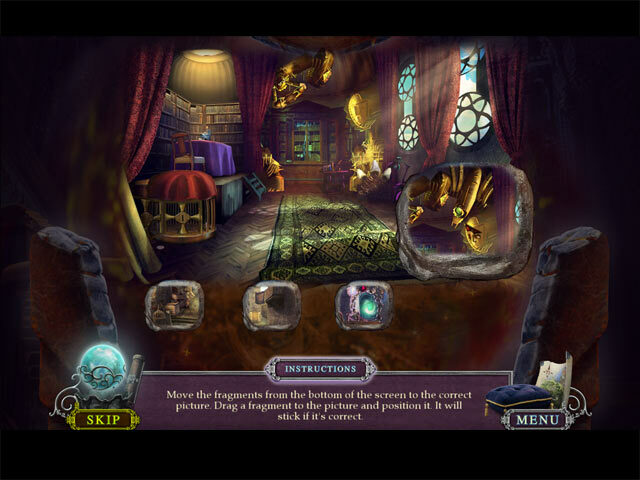 HOGs (hidden object games) - I came across silhouettes (find "x" number of "z") and list type (not interactive) and NO alternative game to play. Mini Games: I found these extraordinarily difficult. The instructions were hard to understand and, as a result, I think I skipped ALL the mini games I came across ----- after spending quite a bit of time trying to solve them. I NEVER skip games so this really upset/annoyed me. CE Bling: Besides the wallpaper, music, etc., you ........... . * Collect 60 crowns. Please note there are MORE than 1 crown per scene. There is an icon on the map that shows a picture of a crown until all have been discovered. * 20 journal clues (have NO idea what this is) I played the game using the "hint" button as opposed to the transportable map which didn't always work. The Strategy Guide did NOT show where the collectibles were located during the demo. Sigh. I was soooo bored. There just wasn't ANYTHING to keep me intrigued with the story OR the game. I quit the demo with 24 minutes left to play. I can't EVER recall quitting a demo before it was finished. It isn't a game for me and is definitely not a purchase. Tristan, on his 18th birthday, received the Ruby Ring which designates him as the rightful leader of Kingdom Minah. Help him defeat the imposter, find his rightful place on the throne and, hopefully, locate his parents. ENJOY! Rated 2 out of 5 by thequeenbag from A children's game for sure. Someone definitely phoned this one in. Very simplistic and cartoonish. The characters don't walk, they hop. No lip movement. Can't see that anything will improve as the game goes on. Rated 1 out of 5 by maevekelly from What a Daaaaaawg! You I know I really like a game or dislike a game if I take the time to review said game. In all fairness I must admit that after watching the reivew clip I could not even bring myself to download this game. My daughter played on her computer and after 15 minutes said I quit. This is not even a fair SE game let alone a CE. But, I agree with other gamers "Review if for yourself, you may like It". Rated 1 out of 5 by Daxadillion from Mind Numbingly Boring! I did complete the full demo just in case the game play became better, it didn’t. It’s definitely not good enough for a CE game. Voices - sounded forced and there was no lip synch. Levels - 4 including Custom. Map - a jump map which shows areas of interest and also shows if you have found the collectible, it’s the only good thing in this game. 60 Crowns to collect - one or two in each scene. Mini Games/Puzzles - nothing new and the rotating rings one was very jerky, so I couldn’t complete it. WARNING - the pace of the game is so slow you might fall asleep, I nearly did!